"Tearoom" redirects here. For other uses, see Tearoom (disambiguation). For the Chinese play, see Teahouse (play). For the help space for new Wikipedia editors, see Wikipedia:Teahouse. A teahouse (mainly Asia) or tearoom (also tea room) is an establishment which primarily serves tea and other light refreshments. A tea room may be a room set aside in a hotel especially for serving afternoon tea, or may be an establishment which only serves cream teas. Although the function of a tearoom may vary according to the circumstance or country, teahouses often serve as centers of social interaction, like coffeehouses. Some cultures have a variety of distinct tea-centered establishments of different types, depending on the national tea culture. For example, the British or American tearoom serves afternoon tea with a variety of small cakes. In China, Japan and Nepal, a teahouse (茶館 cháguăn or 茶屋 cháwū; Standard Nepali:चिया घर) is traditionally a place which offers tea to its customers. People gather at teahouses to chat, socialize, and enjoy tea, and young people often meet at teahouses for dates. The Guangdong (Cantonese) style teahouse is particularly famous outside of China especially in Nepal's Himalayas. These teahouses, called chálou (茶樓) serve dim sum (點心), and these small plates of food are enjoyed alongside tea. Before tea was used as a social drink, Buddhist Monks drank tea as an aid to their meditation. During the Chinese adaptation of Buddhism between 200 C.E. and 850 C.E., tea was introduced as a medicinal herb. It was then evolved to assist Buddhist monks in their meditation by providing the energy needed to stay awake (likely via the effects of caffeine as a stimulant on the brain). Soon thereafter, tea popularized as a commonplace beverage (replacing the previously consumed milk- and water-based beverages) as Chinese teahouses provided a new kind of social life for the Chinese during the 8th-9th centuries C.E. In Japanese tradition a teahouse ordinarily refers to a private structure designed for holding Japanese tea ceremonies. This structure and specifically the room in it where the tea ceremony takes place is called chashitsu (茶室, literally "tea room"). The architectural space called chashitsu was created for aesthetic and intellectual fulfillment. In Japan during the Edo period, the term "teahouse" could also refer to a place of entertainment with geisha or as a place where couples seeking privacy could go. In this case the establishment was referred to as an ochaya (お茶屋), which literally meant "tea house". However, these establishments only served tea incidentally, and were instead dedicated to geisha entertainment or to providing discreet rooms for visitors. This usage is now archaic. Contemporary Japanese go to modern tearooms called kissaten on main streets to drink black or green tea as well as coffee. In Myanmar (Burma), teahouses, known as laphetyay saing (လက်ဖက်ရည်ဆိုင်) and formerly known as kaka saing (ကာကာဆိုင်), are a staple of urban centers throughout the country. These teahouses, which first emerged during the British colonial era, serve milk tea and a variety of delicacies ranging from native dishes like mohinga to Indian fritters (e.g., paratha, poori, etc.) or Chinese pastries (e.g., baozi, youtiao, etc.). Tea shops have traditionally served as venues akin to conversational salons. In Central Asia the term teahouse could refer to Shayhana in Kazakh, Chaykhana in Kyrgyz and Choyxona in Uzbek, which literally means a tea room. 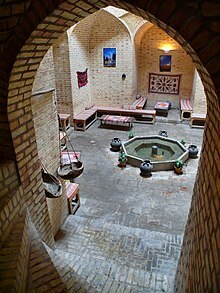 In Tajikistan, the largest teahouses are the Orient Teahouse, Chinese Teahouse, and Orom Teahouse in the city of Isfara. On the 15th anniversary of the independence of Tajikistan, the people of Isfara presented the Isfara Teahouse to the city of Kulyab for its 2700th anniversary on September 2006. Teahouses are present in other parts of Central Asia, notably in Iran and also Turkey. Such teahouses may be referred to, in Persian, as Chay-Khaneh, or in Turkish, çayhane—literally, the "house of tea". These teahouses usually serve several beverages in addition to tea. In Arab countries such as Egypt, establishments that serve tea, coffee and herbal teas like karkade are referred to as ahwa or maqha (Arabic: مقهى‎) and are more commonly translated into English as coffeehouse. In Pakistan, the proniment Pak Tea House is an intellectual tea–café located in Lahore known as the hub of Progressive Writers' Movement. Tea drinking is a pastime closely associated with the English. A female manager of London's Aerated Bread Company is credited with creating the bakery's first public tearoom, which became a thriving chain. Tea rooms were part of the growing opportunities for women in the Victorian era. In the UK today, a tea room is a small room or restaurant where beverages and light meals are served, often having a sedate or subdued atmosphere. The food served can range from a cream tea (also known as Devonshire tea), i.e. a scone with jam and clotted cream; to an elaborate afternoon tea featuring tea sandwiches and small cakes; to a high tea, a savoury meal. In Scotland teas are usually served with a variety of scones, pancakes, crumpets and other cakes. There is a long tradition of tea rooms within London hotels, for example, at Brown's Hotel at 33 Albemarle Street, which has been serving tea in its tea room for over 170 years. Part of the charm of the occasion is an attractive tea set, often decorated china. In a related usage, a tea room may be a room set aside in a workplace for relaxation and eating during tea breaks. Traditionally this was served by a tea lady, not to be confused with a dinner lady. Tea rooms are popular in Commonwealth countries, particularly Canada, with its harsh winters, when afternoon tea is popular. The menu will generally have similar foods to the UK, but with the addition sometimes of butter tarts or other small desserts like nanaimo bars or pets de sœurs. Tea is commonly consumed in other Commonwealth countries alone or in the British fashion. In France, a tea room is called Salon de thé, and pastries and cakes are also served. It seems that having a separate teahouse was a tradition in many countries in Europe. In Germany, one Teehaus was particularly famous during the Third Reich era where the German Dictator Adolf Hitler used to have his daily walk and tea on Mooslahnerkopf hill near his residence Berghof, in the Bavarian Alps. Hitler's teahouse was a cylindrical structure built in the woods. In the Czech Republic, the tea room culture has been spreading since the Velvet Revolution 1989 and today, there are nearly 400 tea rooms (čajovny) in the country (more than 50 just in Prague), which is according to some sources the largest concentration of tea rooms per capita in Europe. In Kosovo there are teahouses known as "çajtore". The popularity of the tea room rose as an alternative to the pub in the UK and US during the temperance movement in the 1830s. The form developed in the late 19th century, as Catherine Cranston opened the first of what became a chain of Miss Cranston's Tea Rooms in Glasgow, Scotland, and similar establishments became popular throughout Scotland. In the 1880s, fine hotels in both the United States and England began to offer tea service in tea rooms and tea courts, and by 1910 they had begun to host afternoon tea dances as dance crazes swept both the U.S. and the UK. Tea rooms of all kinds were widespread in Britain by the 1950s, but in the following decades cafés became more fashionable, and tea rooms became less common. The term "tea shop" may also refer to a retail shop selling dry tea to take home. Dry tea (first, as loose leaves, and then in teabags) used to be sold at grocers' shops, and now mainly at supermarkets. 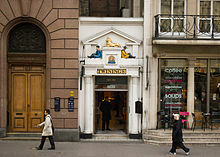 One of the oldest shops that still specialises in selling tea for consumption at home is Twinings, which has been operating from the same premises in central London since it opened in 1706. In the workplace, the term tea room ("break room" in North America) is a room set aside for employees to relax; specifically, to take refreshment during work breaks. Traditionally, a staff member serving hot drinks and snacks at a factory or office was called a tea lady, although this position is now almost defunct. Tea is a prominent feature of British culture and society. For centuries, Britain has been one of the world's greatest tea consumers, and now consumes an average per capita of 1.9 kg (4.18 lbs) per year. ^ "Definition of 'teahouse'". collinsdictionary.com. ^ Laudan, Rachel. Cuisine and Empire: Cooking in World History. University of California Press, 2015. ^ Laudan, Rachel (2013). Cuisine and Empire. Berkley and Los Angeles, California: University of California Press. p. 122. ISBN 978-0-520-28631-3. 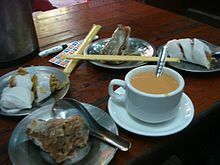 ^ "Tea shops IN YANGON". The Myanmar Times. Retrieved 2018-10-21. ^ "Myanmar/Burma: Music under siege - Freemuse". freemuse.org. Retrieved 2018-10-21. ^ "Ahwa's in Egypt". Hummusisyummus.wordpress.com. 2007-10-31. Retrieved 2012-03-08. ^ Pamela Robin Brandt (2002-10-17). "Miaminewtimes.com". Miaminewtimes.com. Retrieved 2012-03-08. ^ Chrystal, Paul (2014). Tea: A Very British Beverage. Amberley Publishing Limited. ^ "Brown's Hotel". Brown's Hotel. Retrieved 2012-03-08. ^ "ajk - seznam ajoven a obchod ajem". cajik.cz. ^ "esko je zem snejvt koncentrac ajoven na svt. Kam na dobr aj zajt?". Hospodsk noviny. ^ "A guide to teatime in Prishtina". Prishtinainsight.com. ^ "A very British beverage: Why us Brits just love a cuppa". Express. 23 September 2016. ^ "Food Balance Sheets". Food and Agriculture Organisation of the United Nations. This page was last edited on 9 April 2019, at 01:13 (UTC).